The day I have been waiting for in beautiful Bali is finally here; I’m off to Bliss Sanctuary in Canggu. More than a luxury Bali retreat for women, Bliss is a chance to totally relax, unwind and switch off from the world outside with massages and spa treatments, yoga, sightseeing with personal drivers and freshly prepared food; all UNLIMITED! We all know how much I love to travel and my stay there is set to make this the trip of a lifetime. I’ve become a pretty dab hand at planning and organising my vacations over the years and today I thought I’d share some more of my tips with you. This time, its all about the things to do before you go away. Once you’ve booked your summer holiday, the first thing to do is to make an appointment at your doctors to get your inoculations. There are different travel vaccine recommendations for each country and its important that you check which ones you need before you travel, with plenty of time to spare to get booked in and complete treatment. Three sites that I find particularly helpful for this are Travel Health Pro, NaTHNaC and Fit For Travel as they will tell you the recommended injections for each country depending on what area you’re going to be staying in and what you’re going to be doing while you’re there. In the UK, some injections that you need to have before you travel to another country are free on the NHS such as Hep A, Tetanus and Typhoid, which I needed for Bali, and your nurse will be able to advise you on which ones you aren’t up to date with but others need to be paid for privately. This can get costly but it is essential as its pointless planning a fantastic trip if you’re going to end up risking your health for it. Paying for them through your doctor can be more expensive than through a travel clinic so my advice would be to book in there; Superdrug offer a service, as do Boots who I usually book through. The appointments are free and you just pay for the cost of the injection or medication that you need. For Bali, I required Japanese Encephalitis which was two injections, a week apart at £89 a pop. Not cheap to say the least but definitely worth it to protect me while I’m out here amongst the rice paddies and plantations. Plus, when I travel to a country where it is required again, a further top up injection will see me covered for 10 years. Some countries have injections that are mandatory before travel such as Kenya with the Yellow Fever Vaccine. They must be taken and a certificate of proof given as you can be denied entry to the country otherwise. At the time that I travelled there, the vaccination was in short supply in the UK so this is one that you really needed to get booked in for, way in advance of your trip. You’ll also have to arrange some malaria prevention too, such as Malarone tablets, as the mosquitos in Kenya can carry deadly malaria. Sun tan lotions aren’t the most inexpensive of toiletries to buy but they’re the most essential when you’re travelling to a sunny climate. Protecting your skin in the sun is not only going to help to prevent your skin from ageing prematurely but it is also going to dramatically decrease your chance of burning and protect you against skin cancer. Sun protection is worth investing in to make sure you getting the highest level of protection, quality and skincare benefits. 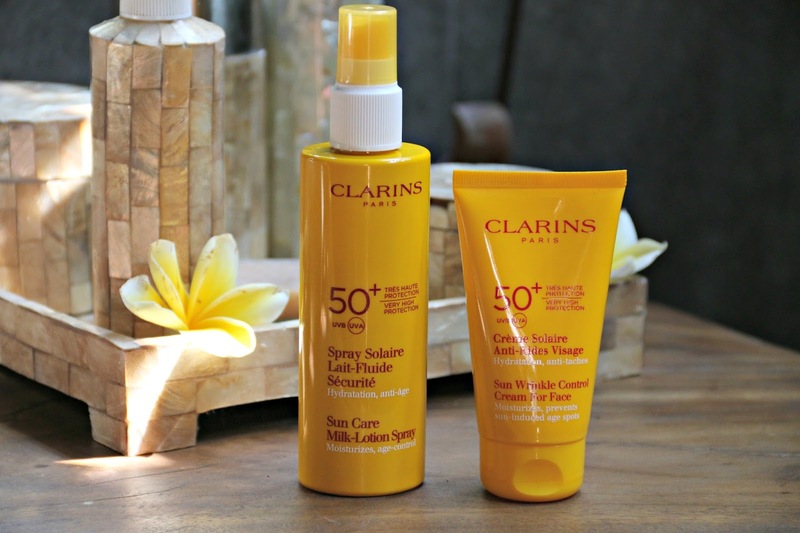 One of my longstanding favourite brands is Clarins who have a fantastic sun care range. Whether you love a milk-lotion spray or the oil, there’s a formula for you and they even do a separate one for the face that wont clog your pores either. Clarins SPF is incredibly high quality, smells divine and leaves your skin soft, nourished and well protected. I like to opt for the highest factors (SPF 30 and 50) in all varieties and have never burnt while using it. Many people are under the misconception that wearing a higher factor SPF stops you from tanning; this is completely untrue, it only prevents you from burning. You can still achieve a beautiful suntan wearing SPF 50 as I do whenever I go away and you can still help your skin along without risking burning and damaging it. Prepping your skin before your holiday is essential for this. Give your whole body a really good exfoliation to get rid of the dead skin cells clogging the surface. My favourite is the Elemis Lime and Ginger Salt Glow which you can read a review of in this post. Remove the body hair you’d rather not have; for me that’s Nair Hair Removal Cream on my legs, a Hollywood Bikini Wax and shaving under my arms as I’m currently having IPL Laser Hair Removal at top beauty therapy salon, Pure Bliss in Sunderland. If you’re anything like me then you’ll have travel sized toiletries from beauty boxes and gifts with purchase all over the place! Collate these things together and head to Boots for whatever you don’t have. The drugstores always have a great selection of travel sized beauty products and they’re often on special offer too. Whenever I’m given a sample size of a product, I keep it in a draw in my bathroom so that when I travel, I’m able to simply pull out that draw and take out everything that I need. 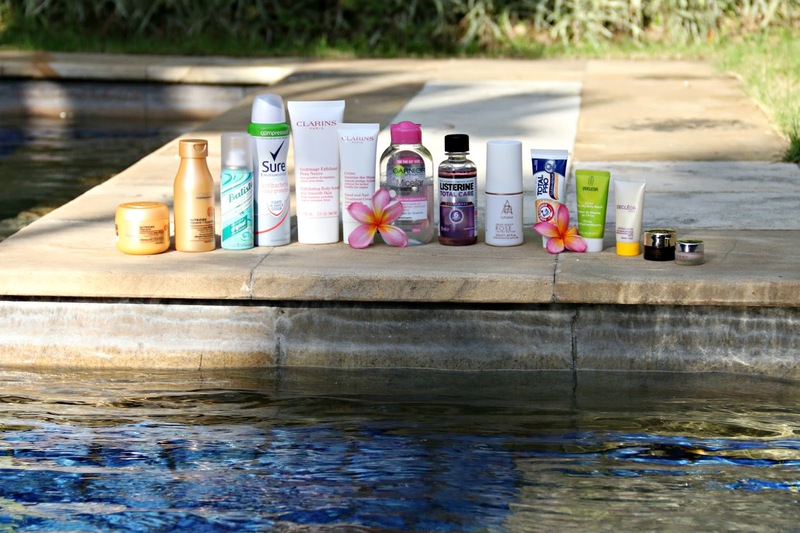 This particular trip to Bali is a long one for me so these products here are by no means everything that I brought with me but they should give you an idea of what great travel sizes are available. Look out for the fantastic Gift With Purchase deals that Clarins do throughout the year too as their deluxe sized samples will see you right through a two week trip! My final tip is to write a packing list of everything that you need to take with you before you start packing. Organise it into clothes, shoes, accessories, hair, makeup, skincare, toiletries, sun protection, etc and make sure you don’t forget things like chargers and adaptor plugs for each electrical that you pack. I always write a list of absolutely everything and then I draw a calendar with the days of the week that I’m going to be there on. In each box, I write the outfit that I’m going to wear, along with accessories and footwear, for the daytime and evening. Some outfits will overlap, in which case I’ll just draw a line through the box, as I tend to take a different outfit for each evening but will wear casual, daytime clothes more than once while I’m away. Organising myself in this way does take a little time but it ensures that I never over pack, only take what I need and therefore don’t end up with ridiculous excess baggage charges! So there we have it; 5 things to do before your next summer holiday. I hope my tips help you! What tips do you have for someone to do before embarking on their summer holiday? Previous Post VICHY Idéalia Peeling: Perfect Overnight Peel for Sensitive Skin! Superb list. I often forgot something during my trips–it can be anything from a mobile charger to my favorite books. This checklist is so useful. I am surely going to use this list during my next vacation. Great post. Buying all the minis and travel sizes are definitely my favourite thing to do when I go away – although considering my next trip is about 10 weeks long, I probably should just bring large bottles with me. Ha! This is such a good list of things to do, I don't go abroad that often so I totally wouldn't think of things like injections. I always do these 🙂 I always write a new packing list each time! YES to sun protection, I know its bad but this is one thats usually on the bottom of my list!! I really need to get better at looking after my skin in the sun its so damaging if we don't! Buying Sun Protection will definitely be the first thing I'll do. As much as we love basking on the beach, we need to love our skin too. We should actually apply sun protection whenever we're out and not just during summer. Getting ready for holidays always makes me so excited and really gets me in the holiday mood. Packing lists are my number one tip, I take them with me so I can repack everything for coming home again too. I like this, especially the skin prep and collecting travel sizes etc. it all makes a difference! I always write my packing list and ensure my sun protection is not missing. Sun protection is so important. I wish that I had of looked after my skin from a young age. Great tips here Laura! I am off on holiday next week, so I'll be taking some of these pointers! Great advice! We're heading off to the far east with the toddler and newborn at the end of the year so I must make sure to check what vaccines they might need. I like the idea of writing a packing list and also writing what you are going to wear when and with what accessories.Its a great way not to under or over pack. Holy crap I never even thought about vaccinations for my upcoming travel plans! Good point! I never even thought about vaccinations with for my upcoming travel plans! Great points. I never thought about vaccinations with my upcoming travel plans! It's something I need to look into!